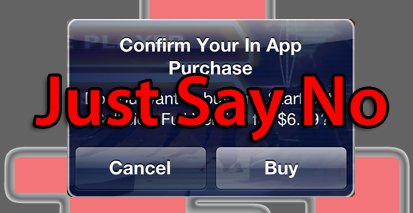 7 thoughts on “Say No to In App B.S. Gameloft is CHOOSING to screw you. It is possible to handle this properly even using the in app purchase mechanism. As an example, I bought AmpKit+. a guitar amp/effects app. It was a universal app. and I use it on both an iPad and an iPod Touch. I bought a couple of fairly expensive in app purchases, and installed them on the iPad because of the extra screen real estate being able to display more pedals. I then went to the iPod Touch, and there was a button in the app saying “Restore purchases”. I touched that, it asked me for my Apple password, and downloaded all of my purchased amps/effects (no rebuy needed). Mo reason Gameloft couldn’t have done something similar. Ha!, as I was typing this, you read my “it’s no Plants vs. Zombies” tweet about Angry Birds, thanks. 11″ Air all the way, I am with David. The keyboard is actually quite a good size because of the widescreen aspect ratio. The Air is also amazingly fast. I have the bottom of the line, and there are many things it does faster than my quad core i5 iMac. The combination of the SSD and a good graphics chip aids speed a lot, as it can swap out to a very fast disk when it runs out of RAM. As an example. Civilization V. which officially requires a 2.4 gHz processor, runs on my 1.4 gHz Air. It is fine for writing of course, but it is by no means limited to that. I edit podcasts, music, and photos on it, and, while I wouldn’t do heavy duty video editing, it could do that in a pinch on the road as well (say, iMovie type work as opposed to Final Cut Pro). If you need to carry movies or good amounts of data, a large USB thumb drive works very well, I use 32GB, but there are larger. Thanks, Bob. Yeah, the 11″ looks REALLY good. I won’t do anything for at least a few more weeks, which is probably smart, as it looks like new MBP’s will be released next week if you believe the rumor site. If so, and the design is a lot different, it may all be a moot point for me. Also, you are spot-on with your first comment. You’re right, GameLoft is doing this on purpose. This means that either they must make it available on all devices, OR they must disclose that this is not going to happen and that it’s on a per device basis. And to clarify my previous comment, that last paragraph is true of consumables, but non-consumables, such as functionality like being able to play a game, seems to be required by Apple to be made available on all devices associated with the purchaser’s account.